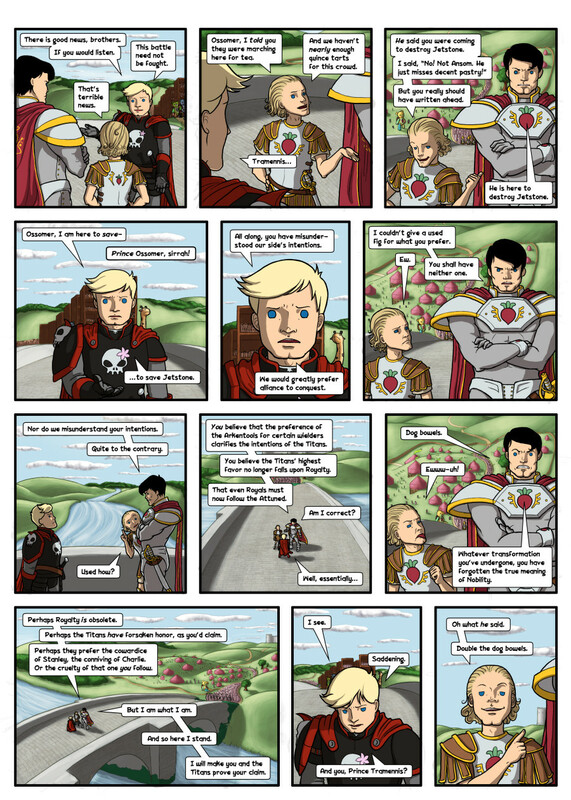 Standing on the Expository Bridge, we look over the shoulders of Princes Ossomer and Tramennis at Ansom. Behind Ansom, rolling green hills dotted with trees stretch out to the horizon. Lining up from the end of the bridge is Gobwin Knob's column, featuring a number of siege towers and Battle Bears in front. Ansom: There is good news, brothers. This battle need not be fought. Prince Tramennis: Ossomer, I told you they were marching here for tea. And we haven't nearly enough quince tarts for this crowd. Prince Tramennis: He said you were coming to destroy Jetstone. I said "No! Not Ansom! He just misses decent pastry!" But you really should have written ahead. 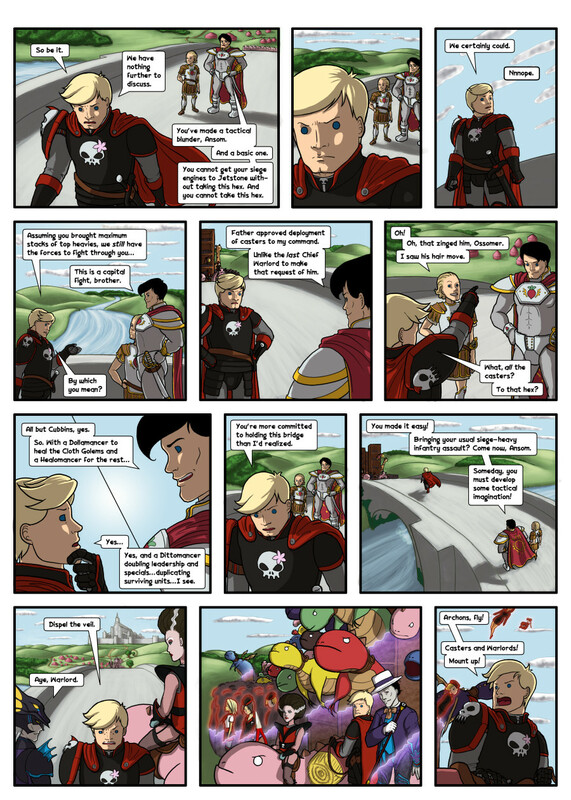 Prince Ossomer: Prince Ossomer, sirrah! Ansom: All along, you have misunderstood our side's intentions. Prince Ossomer: I couldn't give a used fig for what you prefer. Prince Ossomer: Nor do we misunderstand your intentions. Prince Ossomer: You believe that the preference of the Arkentools for certain wielders clarifies the intentions of the Titans. You believe that the Titans' highest favor no longer falls upon Royalty. That even Royals must now follow the Attuned. Ossomer: Perhaps Royalty is obsolete. Perhaps the Titans have forsaken honor, as you'd claim. Perhaps they prefer the cowardice of Stanley, the conniving of Charlie. Or the cruelty of that one you follow. ^ Tramennis has adopted the posture of the teapot of the childrens' rhyme, "I'm a little teapot." ^ This collar resembles that traditionally worn by clergy of several Christian denominations. This page was last edited on 29 December 2009, at 12:52.